The Australian Academy of Science, the peak body for Australian science, has publicly released a booklet, The Science of Climate Change, outlining in simple question-and-answer form the reasons why scientists working in relevant fields have overwhelmingly concluded that human activities have triggered changes to our planet’s climate and that our continuation of current patterns of activity will have a detrimental impact on our future. 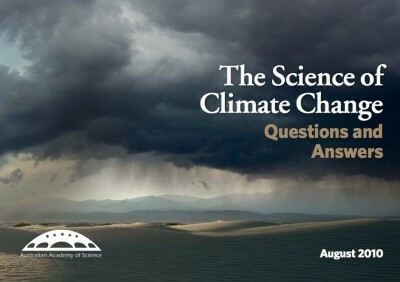 Click here to view The Science of Climate Change. Following is a summary of this significant contribution to the climate debate. The Earth’s climate has changed. The global average surface temperature has increased over the last century and many other associated changes have been observed. The available evidence implies that greenhouse gas emissions from human activities are the main cause. It is expected that, if greenhouse gas emissions continue at business-as-usual rates, global temperatures will further increase significantly over the coming century and beyond. • Physical principles established more than a century ago tell us that greenhouse gases, such as carbon dioxide (CO2), trap heat and keep the planet warmer than it would otherwise be. Increasing greenhouse gas levels raise the temperature of the Earth’s surface. • The record of the distant past (millions of years) tells us that we cannot take a stable climate for granted. Climate has varied greatly through the Earth’s history. It has, for example, gone through 10 major ice age cycles over approximately the past million years. The past few thousand years have been unusually stable. Together with our understanding of physical principles, evidence from the past shows that climate can be sensitive to small external influences. • Measurements from the recent past (the last 100 years) tell us that the Earth’s surface is warming along with rising levels of greenhouse gases from human activities, and that this warming is leading to other environmental changes. Although climate varies from year to year and decade to decade, the overall upward trend of average global temperature over the last century is clear. • Climate models, together with physical principles and knowledge of past variations, tell us that, unless greenhouse gas emissions are reduced and greenhouse gas concentrations in the atmosphere are stabilised, global warming will continue. Climate models estimate that, by 2100, the average global temperature will be between 2°C and 7°C higher than pre- industrial temperatures, depending on future greenhouse gas emissions and on the ways that models represent the sensitivity of climate to small disturbances. Models also estimate that this climate change will continue well after 2100. A 2°C global warming would lead to a significantly different world from the one we now inhabit. Likely consequences would include more heat waves, fewer cold spells, changes to rainfall patterns and a higher global average rainfall, higher plant productivity in some places but decreases in others, disturbances to marine and terrestrial ecosystems and biodiversity, disruption to food production in some regions, rising sea levels, and decreases in Arctic ice cover. While aspects of these changes may be beneficial in some regions, the overall impacts are likely to be negative under the present structure of global society. A warming of 7°C would greatly transform the world from the one we now inhabit, with all of the above impacts being very much larger. Such a large and rapid change in climate would likely be beyond the adaptive capacity of many societies and species. There are uncertainties in climate science. For example, a precise value cannot be given for the likely range of warming because of uncertainties in climate sensitivity to small disturbances, although climate models and evidence from past climate change provide a plausible range of values. Climate changes over small regions and changes in rainfall patterns are very hard to estimate. Tipping points or rapid climate transitions associated with overall global warming are possible but cannot yet be predicted with confidence. These uncertainties work in both directions: there is a chance that climate change will be less severe than the current estimates of climate science, but there is also a chance that it will be more severe. This document aims to summarise and clarify the current understanding of the science of climate change for non-specialist readers. The document is structured around seven questions. 1 What is climate change? Climate is a statistical description of weather conditions and their variations, including both averages and extremes. Climate change is a change in the average pattern of weather over a long period of time. Greenhouse gases play an important role in determining climate and causing climate change. 2 How has Earth’s climate changed in the distant past? Global climate has varied enormously through Earth’s history. Evidence from the past shows that global climate can be sensitive to small influences. Past records also show that climates can shift abruptly. 3 How has climate changed during the recent past? Global average temperature has increased over the past century. Evidence for this comes from instrumental temperature records in the air and the ocean. Temperature observations are not the only evidence of recent climate change: other sources include trends in sea levels, glaciers, ice caps and atmospheric water vapour that are consistent with global warming. Australia’s climate has changed along with global climate. 4 Are human activities causing climate change? Human activities are increasing greenhouse gas levels in the atmosphere. It is very likely that most of the recent observed global warming is caused by this increase in greenhouse gases. 5 How do we expect climate to evolve in the future? Climate models and studies of past climates indicate that global warming and associated changes will continue if greenhouse gas levels keep rising as they are now. It is very likely there will be significant warming through the 21st century and beyond. Reduction of greenhouse gas emissions could significantly reduce long-term warming. 6 What are the consequences of climate change? Climate change will have significant impacts on our society and environment, both directly and by altering the impacts of other stresses. 7 How do we deal with the uncertainty in the science? Although climate forecasts are uncertain and will remain so, the broad conclusions of climate change science as outlined above are based on many lines of evidence which together give a high degree of confidence. Partly because of scientific uncertainty but also because many aspects of human life are involved, decisions about action on climate change will need to involve extensive consideration of issues beyond science, including ethics, economics and risk management.